From the descriptions I read, this is a novel about a girl diagnosed with Turner Syndrome and how her condition tears her family apart. That is what part of the book is about, sure, but it's a lot more than that. Gwen's brothers and both of her parents are also given equal weight in this family saga. The diagnosis was just the last straw for her parents' already doomed marriage, which becomes clear as their characters are fleshed out post-divorce. Her brothers have their own problems too; eldest brother Billy has compartmentalized his life so his family won't find out that he's gay, while Scott bides his time in an unsatisfactory marriage. I read about this book on Jennifer Weiner's blog, and I wonder why I haven't heard more about it. It's a great portrait of a dysfunctional family, readable, compelling, and engaging. 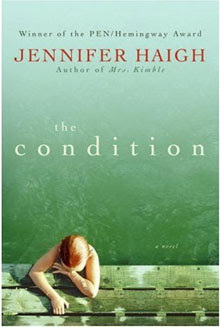 Haigh does a such a good job of illustrating the differences in the lives of each family member that the reader can imagine what it feels like to step from one character's living room to another. She also makes it easy to see how each person's internal struggles effect the rest of the family. I can't imagine why there hasn't been any buzz about this book, but I will certainly be recommending it frequently.